To start, wash sweet potatoes under warm water and poke multiple times with a fork. Instead of wrapping individually with tin foil, place on a cookie sheet and cover the cookie sheet with tin foil. Aren’t sweet potatoes so beautiful…? Place two sweet potatoes in oven and cook for 45-60 minutes at 400 degrees Fahrenheit. Sweet potatoes are done when they can be easily pierced with a fork. I cooked three because I was making one for my 6 month old son, can you tell which one is for him 🙂 It was his first time trying sweet potatoes and he loved it! While potatoes are in the oven rinse, cook two cups of quinoa on the stove top. Bring quinoa and 4 cups of water to a boil and then reduce heat to medium until all the water has diminished and the outer rings appear on the individual grains. Once cooked, remove from heat and add approximately one Tbs of coconut oil to give quinoa a softer texture. In an 8×8 casserole dish dip five corn tortillas in 8 ounces of your favorite enchilada sauce. I use frontera brand. Let sit while sweet potatoes continue baking to allow sauce to soften tortillas. Once sweet potatoes are done, cut open long ways and mash insides with a fork, place insides in a separate bowl with cooked quinoa. Combine potatoes and quinoa together, mix well- you don’t want any sweet potato chunk. A this point you should have a even texture throughout….Kind of looks like cookie dough! Add a dash or two of salt to quinoa mixture. The great thing about combining quinoa with sweet potatoes is that it softens and sweetens the quinoa but, doesn’t add a strong sweet potato flavor. Once all have been stuffed and rolled then squeeze half a lime onto tortilla tops. At this point you’ll probably have some tortilla stuffing ingredient left over. Place left over beans, corn, onion, and quinoa mix on top of tortillas and pat down. We’re trying to get the most bang for our buck here, or yummy food per serving. Add remaining 8 ounces of enchilada sauce to top of dish and place in oven. Cook enchiladas at 350 degrees Fahrenheit for about 40 minutes, just until dish is heated through. My sauce was spilling over… I do love sauce! Once your timer goes off your dish is now ready, hooray! Serve with favorite salsa, Perfect Guacamole or both! Enjoy! Begin with baking sweet potatoes. I washed and poked with holes then placed on a tin foil covered cookie sheet. Bake at 400 degrees Fahrenheit for 45-60 minutes, until inside is soft. While sweet potatoes are baking begin cooking quinoa. Place 2 cups of quinoa and 4 cups of water into a pot and bring to a boil, once boiling reduce to medium heat and continue to cook until water is gone. Mix in coconut oil, remove from heat and set aside. Place five corn tortillas in the 8×8 casserole dish you’re going to use later and cover with 8 ounces of enchilada sauce. Let soak while sweet potatoes are baking. Once sweet potatoes are ready cut in half long ways and place soft insides in a separate bowl with cooked quinoa. Mix and mash until completely mixed. You should have a soft even texture. Now it’s time to stuff your tortillas, open tortilla and place quinoa mix, corn, beans, and onion inside then roll tortillas in a traditional enchilada fashion. Once you’ve completely stuffed and rolled all five tortillas squeeze half a lime onto dish. With the remaining tortilla stuffing ingredients place on top of tortillas and pat down. Pour remaining sauce on dish and bake at 350 degrees Fahrenheit for about 40 minutes, just until dish is heater throughout. You beautiful enchiladas are now ready to be serve, serve with favorite salsa, Perfect Guacamole or both! Enjoy! When it’s cold outside, there isn’t anything much better than a warm bowl of soup to get you through winter nights. Soup hasn’t been one of my favorite meals for long, I used to be disappointed whenever I ate it because I never felt full. 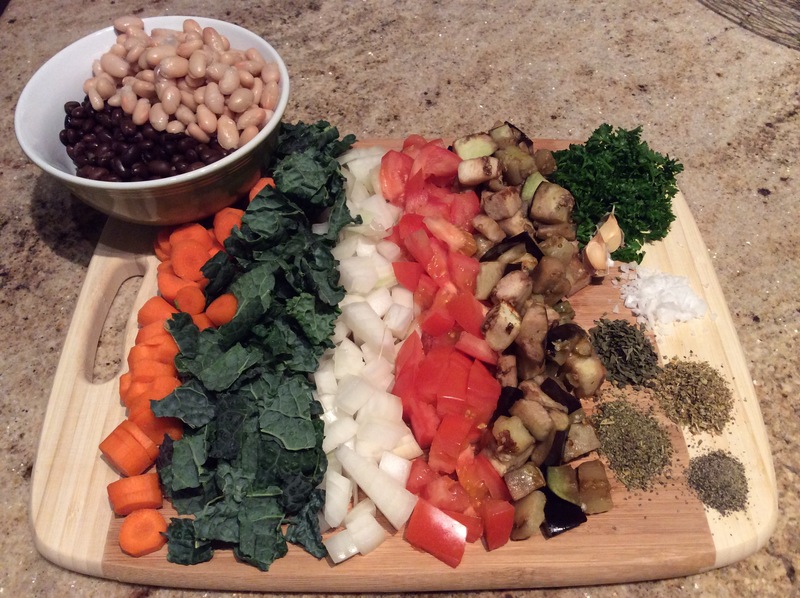 This colorful dish is packed with protein and veggies, it’s healthy, harty, and delicious! There is something so satisfying about taking 8 plus fresh ingredients and making a beautiful dish from scratch, that also happens to be tasty; so get to it! Chop, chop, chop all veggies and place in crock pot. Add in drained and rinse beans and spices. Now add vegetable broth and stir. Set crock pot to high for three hours or low for five. Stir occasionally to integrate spices evenly into soup. Yep, it’s that easy! Serve, sip and enjoy! If I had to pick only one genre of food to eat for the rest of my life it’d probably be…Mexican. My husband and I have spent many days in Mexico working at a church our home church in California is affiliated with. One of the highlights of our trip, other than serving the people, would be the food! Is there anything better than an authentic street taco? Sadly, I’m sensitive to gluten and dairy (I know, lucky me). My food problems can keep me from enjoying some of my favorite, so I’m happy when I can create a Mexican inspired dish that doesn’t make me sick. Chipotle and garlic don’t normally go hand in hand in my mind, but in these tacos they compliment each other perfectly. These tacos are healthy, juicy, and muy rico! Start by washing, skinning, and chopping three russet potatoes and place in a separate bowl. I try to chop potatoes into smaller bite size pieces. Once in a bowl, top with salt to taste and three cloves of minced garlic. (After this step, I let the bowl sit on the counter for one hour because I wasn’t ready to bake. Consequently, some pieces turned brown. This was okay because it was just a product of the potatoes being exposed to oxygen). Place potatoes on a cookie sheet covered with path net paper and bake at 400 degrees Fahrenheit for about an hour. Check occasionally to assure potatoes don’t get overcooked. While your beautiful garlic potatoes are going from ivory to golden brown, take a break until your timer reads 15-20 minutes left. Now that your potatoes are nearing their end in the oven, turn your attention to the stove. Place a large skillet over medium heat and dump bag of spinach. Turn spinach with a utensil until spinach becomes soft. Once soft, empty one can of drained black beans into pan and mix together. Once warmed pour 8 ounces of your favorite chipotle sauce over the beans and spinach and mix together. Keep skillet over low heat for about ten minutes to let the flavors marinate! Your yummy juicy, crunchy tacos are now ready to be served. On a corn tortilla fill with potatoes and top with chipotle mixture. Tacos are tasty as is or topped with Perfect Guacamole. Go eat and enjoy! Wash and peel potatoes then chop into cubes. Place all potato cubes into bowl, add minced garlic, salt and stir together. Place potatoes on top of parchment paper on a cookie sheet and bake at 400 degrees Fahrenheit for about an hour. Check potatoes occasionally to make sure they reach desired level of crispness. Depending on size of cubes might need more or less than an hour. In a skillet, heat spinach and drained beans over medium heat. Once spinach softens add chipotle sauce and let simmer for approximatly ten minutes. Your tacos are now ready to eat. Place cooked potatoes in warm tortilla and top with chipotle mix. Serve with Perfect Guacamole! Enjoy! One of my all time favorite lunches! Yep you heard it, I sometimes make guacamole as my main dish for lunch. I will also make it in the morning, for an afternoon snack, late night snack, side with dinner… You get the picture. Having ready to eat avocados in our home is a must! You can make guac in many different ways and some of them are are not so good. I can tell you from experience it’s a bad day when things go south. But, thankfully, I’ve mastered a guac recipe that I’m excited to share with the world. It’s simple, yet perfect! To start, peel avocados rather than cut, this way you don’t lose some of the greener part of the avocado that is sometimes hard to get when you scoop with a spoon. The greenest part of the avocado has the most antioxidants, let’s make sure to eat it! Once avocados are peeled and placed in bowl- mash, mash, mash. Once mashed add lime, garlic, tomatoes, and salt. Scoop with favorite chips and enjoy!